Can Khattaks’ family influence make up for poor performance? 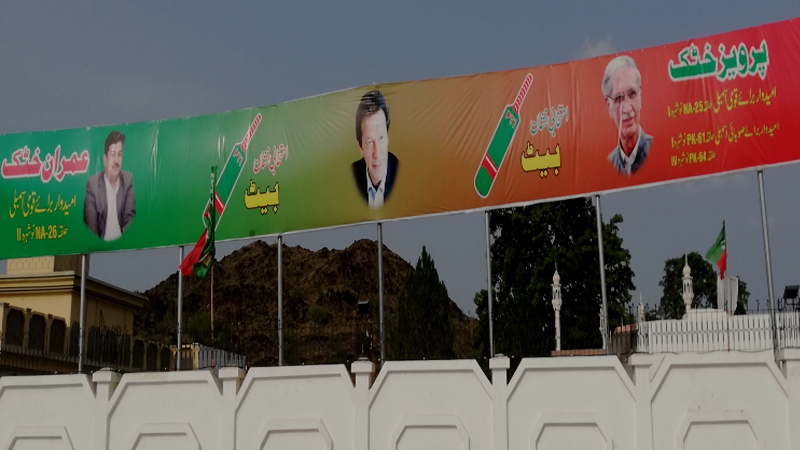 Travelling from Nowshera city to Manki Sharif, the native village of former KPK chief minister, Parveez Khattak, election posters and banners can be seen for just two parties: Pakistan Tehreek-e-Insaf (PTI) and Awami National party (ANP). No other candidate from any political party or an independent has found it necessary to put up campaign material in the area since it is believed that it will be a two-way fight here. But outside the area, the entry of billionaire Khan Parveez, who has recently joined the PPP, has changed the dynamics in the electoral race in NA 25 Nowshera. The recent verbal attacks made by Khattak on the PPP that went viral as well were linked to the competition he has felt after Parveez’s entry. In 2013 general elections, PTI clean swept from Nowshera, getting two national and 5 provincial assembly seats, but 2018 will be a tough battle for the party, due to the poor performance of Khattak, say political analysts. On NA 25 (old NA5), Khattak secured 69,873 votes while the runner up was Daud Khattak of ANP who got 21,185 votes. When Khattak became the CM, he diverted his attention to provincial politics, and left the seat for his son-in-law Imran Khattak, who won the seat in the by-poll. On NA 26 (old NA6), Siraj Mohammad Khan of the PTI secured 54,266 while the runner up was Syed Zulfiqar Ali Shah of the PMLN who got 34,547 votes. This time, Khattak is contesting from NA25, while his strong rivals are ANP’s Malik Jumma Khan, and PPP candidate Khan Parveez. Other contestants here are ex-PTI MNA Siraj Mohammad Khan, who is now contesting on PMLN ticket, and Ayesha Gulalai Wazir, who is contesting from her party Pakistan Tehreek-e-Insaf Gulalai (PTI-G). In NA 26, Khattak’s son-in-law and former MNA Imran Khattak is contesting the election against Jamal Khattak of the ANP, an influential candidate. MMA candidate and son of late Qazi Hussain Ahmad, Asif Luqman Qazi is another prominent candidate here, though analysts believe that he is not likely to be a frontrunner. Pervaiz Khattak is contesting from PK 61 where his strong opponent is Pervaiz Ahmad of the ANP. In 2013, Qurban Ali Khan of PTI secured 9,282 votes, while the runner up was Pervaiz Ahmad, who secured 8,807 votes. Qurban Ali Khan was among the 15 MPAs issued show cause notices by PTI chairman Imran Khan after Senate elections. From PK 64, Khattak is contesting against Mohammad Shahid of ANP, and Pervaiz Khan of MMA. In 2013 general election, Khattak defeated ANP candidate Mohammad Shahid with a margin of 13,000 votes. In 2018 general election, Khattak is considered to be in a strong position but his focus is limited to his native areas only. From PK 65, former provincial information minister and ANP secretary general, Main Iftikhar Hussain will contest against Khaleequr Rehman of the PTI, who defeated the former in 2013 elections with a margin of 16,000 votes. Analysts said Mian Iftikhar Hussain’s campaign was going strong in the area but a suicide blast that claimed the life of Haroon Bilour impacted his campaign, as well as other ANP leaders’ campaigns. When contacted, close aides of Mian Iftikhar said, however, that they were not the ones to leave the field open for the PTI, and they would continue to fight despite the odds being stacked against them. From PK 62, former MPA Mohammad Idress won with 21,935 votes against PMLN’s Mohammad Nihal, who got 9,898 votes. This year, Idress, Nihal, Amir Alam and Khalil Abbad are strong candidates in the constituency. From PK 63, PTI’s Jamsheedud Din won with 15,954 votes in 2013, while the runner-up was Ikhtiar Wali Khan of PML-N who got 9,484 votes. For 2018 election, former PTI MPA Qurban Ali Khan, who quit the party and joined Jamiate Ulema Islam is considered to be the strongest candidate, due to his personal votes based on development works carried out in the constituency. Like several other areas in the region, many of the PTI government’s claims about reforms in health and education sectors could not be established based on circumstantial evidence. Still, he said, no mega project was started in Nowshera in the last five years, alleging contractors who were awarded the projects by the Khattaks were involved in corruption of hundreds of thousands of rupees. A Nowshera native studying in China, who recently returned to cast his vote, said that he got inspiration from Imran Khan’s speeches and returned to participate in the elections. “Pakistan will become free of corruption and Imran Khan is the sole hope for change,” he said. 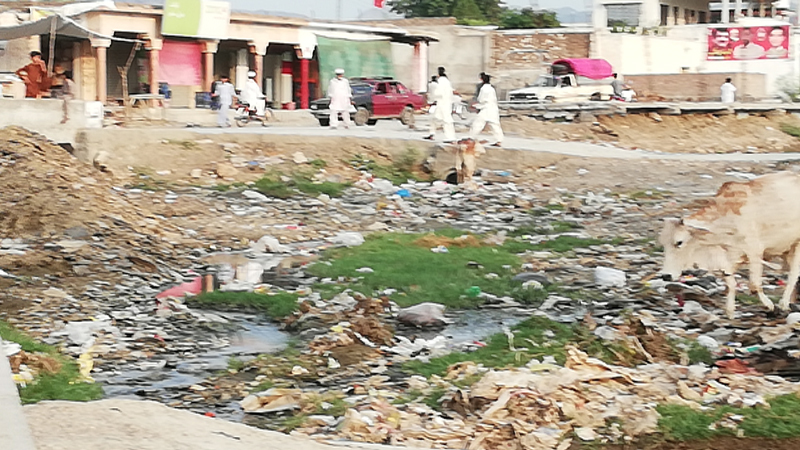 In Khattak’s native village, many voters complained about the poor state of the drainage system, saying that their areas remained flooded for days after a single spell of rain. Several said that they believed that installation of biometric attendance machines had brought a positive change to the public service delivery at hospitals and schools. However, Usman Khan, employed at a local hospital as a resource person, said that only those not supporting the PTI were being held accountable through the biometric system. In its district ranking survey on education, the KP elementary and secondary education department placed Khattak’s native constituency on seventh number in terms of facilities and services. According to the Annual Statistical Report of the government (2017-18) as well, the situation on ground is quite abysmal. The statistics show that 240 rooms in different primary schools are in a derelict condition, needing repairs, 93 rooms in primary schools require full reconstruction, as well as around 58 rooms in middle schools, 211 rooms in high schools and 132 in higher secondary schools need to be rebuilt. The statistics add that about 15 schools in the district do not have any boundary walls, 51 have no clean drinking water, 100 are without electricity and 20 have no toilets.